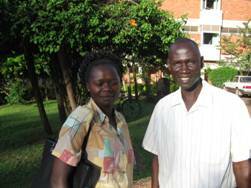 For three years BHW has been partnering with Thomas and Joyce Lubari (UGA04a). They are based in Jinja, Uganda, the source of the River Nile. They are refugees from Sudan and have lived in Uganda for many years. Their family has all grown up in Uganda. Thomas and Joyce have proved themselves to be very committed to ministry to the poor in the time we have known them; they spend all their money on others and give their lives to help people. This development of a micro-loan programme in Jinja, based around the church they have planted is an exciting development. It has emerged over a period of two years. The plan is that this will be a pilot project and as it develops other programmes will be started both in Uganda and in Sudan. Thomas travels back there frequently and is very keen to set up a similar programme amongst the rural people of Sudan. There are many issues to face there, so this pilot is a test. The beneficiaries are mainly families with little or no chance of employment. They are church members and have been selected from the church as those with potential. They have all attended a seven week training programme before obtaining their first loan. We like the enthusiasm and strength of the key leaders; they are experienced, and have agriculture and financial training. They have selected a team to oversee the running of the project. This partnership deals with some of the poorest people in Uganda. Most have significant trauma to deal with and have been displaced from their places of origin with no likelihood of return. They are the victims of abuse and genocide and need a helping hand. 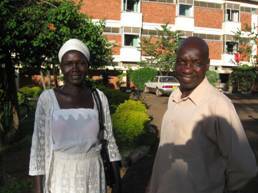 Thomas and Joyce Lubari have lived in Uganda for many years. Thomas has a background in agriculture and theology and is currently pastoring the church they planted in Jinja. Joyce is trained in accounting and currently works in the administration department of a Bible School. She is the only one earning a salary. Joyce will be the manager of the loan scheme. A team from the church has been selected to oversee the loan programme. Their role is to meet regularly and discuss membership, issues that develop and follow up with the beneficiaries. They will be able to access loans along with other people. Judith is a young woman with a lot of personality. She has six sisters and four brothers and in families like hers life is very difficult. Her mother is a believer but not her father. Her parents are farmers and some years it is very difficult, especially with so many children to feed and care for. She still lives with her parents. She became a Christian in 1998 and goes to the church Thomas started. Around 75% of the people in church are women. 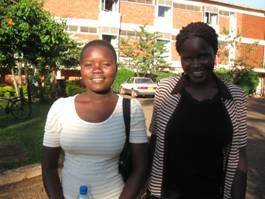 She wants to be a nurse in the Jinja area. To become a nurse she needs a loan to start a business. She would start by selling clothing and grow her business to support her training. Winnie wants to study HR management. Her family would be able to help her with some funds for education but she wants a loan to make food to sell to other students. She has a lot of drive and enthusiasm. She became a believer in 2002 through Scripture Union. She fully trusts Jesus she says and he never fails her, he remains firm. Her parents are not believers and there are six children in the family. Rose was married in 1983 and has six children and one grandchild. Her husband is a policeman. She became a Christian at Life Gospel Church in 1997. Her husband is not a believer yet. Her children are all believers. She has been involved previously in the leadership of a loan programme. She left it two years ago and it is still operating. She thinks that a loan programme is very important for people to help lift them out of poverty, every person should be able to access something like this. Moi is a local body councillor. He’s a very busy man and could only come to the meeting briefly. He is totally convinced that this sort of programme is the way out of poverty and the best thing any donor can do is support the establishment of this sort of programme. The strategy is to run this pilot for two years. Each participant will have to attend the training sessions and pay a deposit to join the programme, the deposit will be around Uganda Shillings (U/=) 50,000 or $US25. The deposit will be brought in over a period of time. Once they are approved, they will then be allowed to take the first loan. To get that they have to submit a proposal. The paperwork for the loan programme has been borrowed from the BHW partnership in Busia (UGA02), only about 2 hours away. Thomas has been there to observe how it operates. The maximum first loan would be U/=200,000 or $US100, but most of them would be less than that. According to the committee, most people will start with small kiosks, fish trading (Jinja is on Lake Victoria) and farming. The scheme will start with between 30 and 50 people but many more than that have signed up for it. To become a participant they have to have a letter of recommendation from their local community and two other witnesses.